The court bakery of Ramesses III. "Various forms of bread, including loaves shaped like animals, are shown. From the tomb of Ramesses III in the Valley of the Kings, Twentieth Dynasty of Egypt." In ancient Egypt, bread was one of the most important food staples; it was eaten daily by both rich people and the lower classes. We know some of this everyday routine of the ancient Egyptians because we’ve found drawings depicting its production. There are even several examples of bread found in tombs. So, even if we don’t have a recipe to follow, there are several assumptions we can make in order to recreate this dish. The main ingredient for bread is always the flour. In this case, it is made from grains of a specific variety of wheat called emmer. Finding this was perhaps the most difficult part of the process. The grains cultivated in ancient Egypt were wheat and barley. 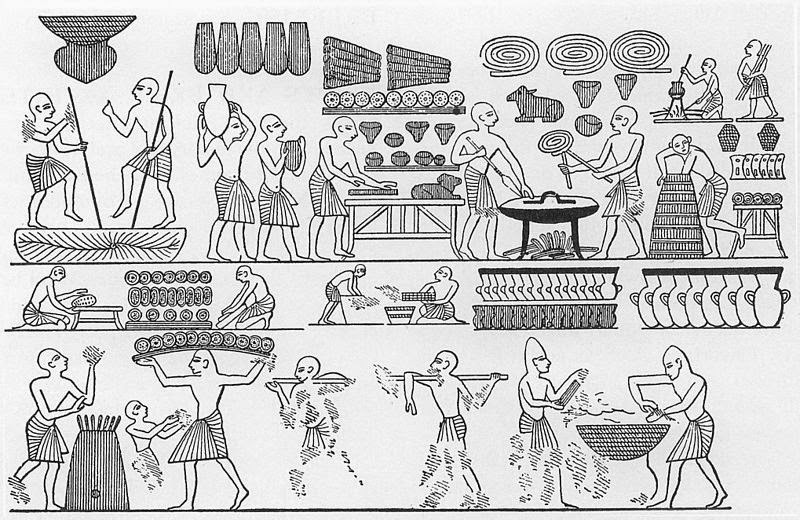 Wheat had an important place in the Egyptian economy. It was not only used for bread making, but also as form of payment, both as the treasure of the state in the vaults and as investment for more difficult times. 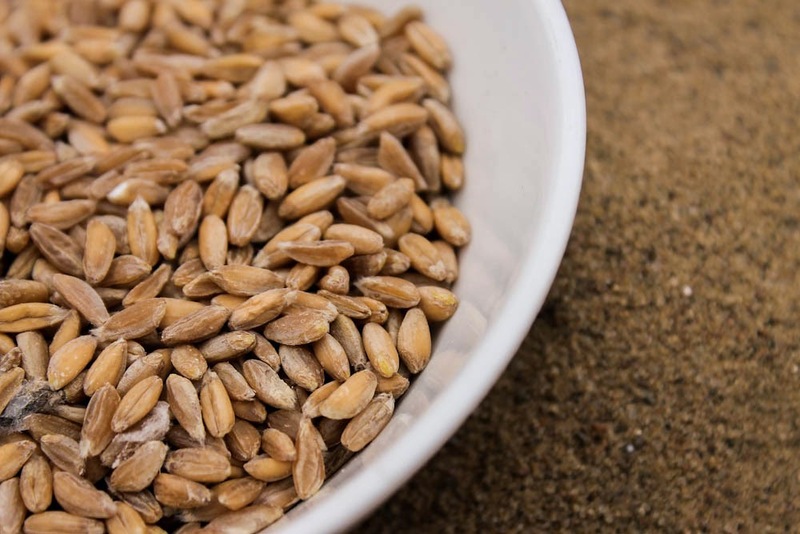 The variety of wheat used for this ancient bread making is called emmer, also known as farro. This was one of the first crops domesticated in Egypt and surrounding regions and closer to the wild varieties than the wheat we consume today. Nowadays the crop is mostly out of use, and is only cultivated in some mountainous regions of Europe and Asia. Luckily for me, emmer is one of several varieties of grain which are experiencing a resurgence. These “Ancient Grains” are being introduced in health and other specialty stores. Emmer sometimes used to replace other grains because of its high fiber content, low gluten content, and organic quality. It’s somewhat more popular in Italy, as it is used to make pasta. 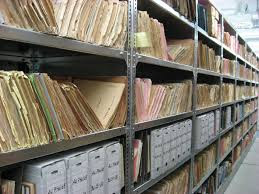 Yet emmer was almost unknown by clerks at the stores I visited; I had to ask several places before finding it. 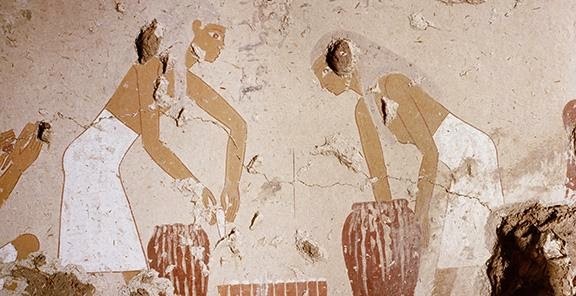 A painting detail in the tomb of Senet showing bread making. As seen in the scenes in the tomb of Senet and similar drawings, the most depicted part of the recipe was the process of processing the grain. With a heavier husk, the process of removing it without breaking the grain was long and challenging. In emmer, the chaff does not come off through threshing, but comes in spikelets, which need to be removed by moistening and pounding with a pestle to avoid crushing the grains inside. It was then dried in the sun, winnowed and sieved, and finally milled on a saddle quern. Once that was done, the milling of the grain presented also some difficulties. Egypt's Middle Kingdom didn’t have mills, and flour was mostly produced by hand by the women. The result was coarse flour, which had ash, pieces of husk, and even sand. It was sifted several times, but the result wasn’t optimal. Since this kind of flour went rancid quickly and storage wasn’t an option, Egyptians could only make the amount needed for the day. I decided to try to replicate a portion of this practice to make an Egyptian bread closer to its ancestors. It was possible to get emmer flour, but I decided to go with the actual grain to get a more accurate result. I didn’t need to remove the husk because it was already processed. The grain was small, darker than regular wheat, and really hard. I started working with a kitchen mortar and pestle, most likely a similar to one used by an Egyptian woman. I started grinding the grain while I was sitting in front of the TV. It took me a couple of hours and by the end my arms were aching. It was a tiring and time-consuming process. I worked with just a handful of grains at a time, hitting and grinding the grain, and trying to find the best technique. First, I tried cracking the grain, then grinding on the sides of the mortar. Finally, I decided to try a combination of hitting and grinding for finer results. The result was a coarse flour with some bigger pieces. I tried to cheat using a coffee grinder, but the result was surprisingly similar. Without an actual milling machine, I don’t think it’s possible to get a really fine flour. I couldn’t imagine how the Egyptians managed to get a finer result using traditional tools. Apart from the additives, the basic ingredients of the bread we use today are not that different from the ingredients used by the ancient Egyptians. Flour, water, and salt are the basis of any bread, and everyday ancient breads were pretty similar. On special days, the nobility had more elaborate breads, adding fruits and other grains to enhance flavour. Flavourings used for bread included coriander seeds and dates, but it is unknown if these were ever used by the poor. The only element that can bring some debate to this recipe is the yeast. Some scholars believe that the Egyptian breads were mostly flatbreads, similar to the pitas that you can still find in Egypt. Others believe that Egyptians used some kind of leavening. The Bible's Book of Exodus, for example, talks about the Hebrews leaving the unleavened bread to be able to flee from the Egyptians. 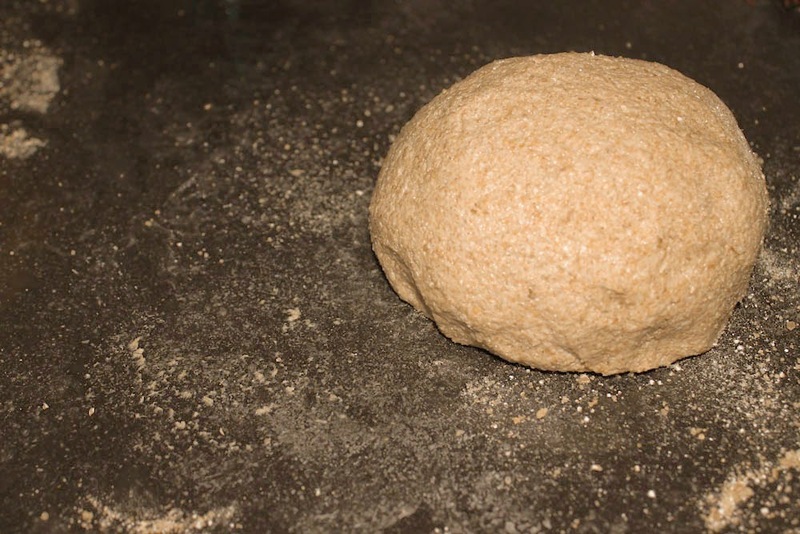 The cultivation of wild yeast present in the air and in the water is one of the oldest bread making traditions. Flour and water that has been left outside after a while tends to grow some variety of wild yeast. Not only does this improve the texture, but also the flavor. Pieces of that bread can be used later on to make more bread, or like the Sumerians did, to make beer. This actually became a way of cultivating and domesticating the best strains of yeast. Yeast strains present in the Nile are still used today for bread and beer-making. The two staples of the Egyptian diet, often produced side by side, were bread and beer. Even if they didn't use beer to make bread (something that is easy to assume they did), the yeast present on the air and on the grain probably was present on the bread that was left out in the air. Archeological evidence shows that beer was made by first baking "beer bread,” a type of well-leavened, lightly baked bread that did not kill the yeasts, which was then crumbled over a sieve, washed with water in a vat and then left to ferment. Moreover, a strain of yeast, Saccharomyces cerevisiae present in the region of the Nile, was found to be used in bread and beer making. Wild yeast can easily be done at home by creating a sourdough starter. As I didn't have any sourdough starter available, I had to cheat using another common technique called sponge. With this, you create a mock-starter, by jumpstarting it with just a little of store bought yeast. 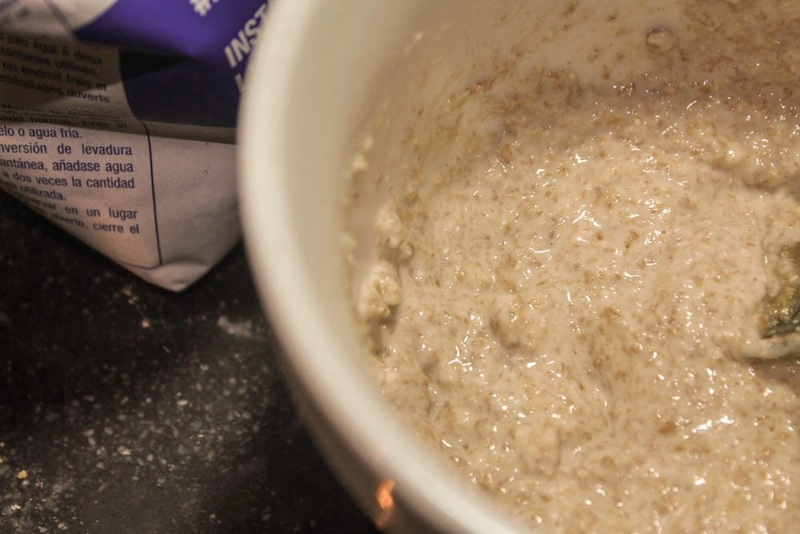 With the same amount of water and dough and a little bit of sugar, you just need to add a quarter teaspoon of yeast. You leave this mix for 24 hours and the yeast will grow becoming stronger as well as develop flavour. In the case of this bread, I made a small batch of sponge (⅓ cup of my emmer flour, ⅓ cup water, ½ teaspoon honey and ¼ teaspoon yeast) and left it outside for 24 hours. Because the emmer doesn't have much gluten, the sponge didn't bubble like it usually does, but the texture became pasty. 24 hours later I mixed this sponge with two and a half cups of emmer flour, and added warm water. I started to mix this until I got a ball of dough. The dough was heavy and a little bit grainy. I added water until the texture felt correct. It was much less pliable than a regular whole wheat dough because of the low content of gluten. But after a while, it started to develop a little bit of elasticity. I let it rise for one hour in a warm environment and then it deflated. The dough didn't actually rise much, but the surface cracked a little bit, so something inside was alive, and the texture became a little more subtle. I didn't want to risk adding more water, because this flour didn't seem to absorb much. In retrospect, perhaps I should’ve added more. I shaped the dough in a triangle form, which is the same form as some of the breads archeologists found, although it is known that the breads were shaped in many different forms: regular round breads, geometrical shapes, and even in the shape of a person or an animal. Once shaped, I let it rise for another hour. The surface of the bread cracked again. This was perhaps the hardest step to duplicate, because I don't have the time or space to create a brick and mortar oven. During the Middle Kingdom bakers used tall cones on square hearths. In the New Kingdom a new type of a large open-topped clay oven was created. It had a cylindrical shape and it was encased in thick mud, bricks and mortar. The dough was then slapped on the heated inner wall and peeled off when done, similar to how a tandoor oven is used today for naan and pita bread. Bread was also baked inside clay vases. This kind of vase was done just for this purpose, and normally broken after the bread was baked, so it was an expensive method, primarily used for special occasions. Because of the difficulty to replicate this step, I decided to bake it in a regular oven at 400 degrees on top of a baking stone. The bread didn’t have an oven spring, and it was difficult to determine when it was done. The color changed slightly but it didn’t have the darker, caramel color of traditional bread. In the end, I took it out of the oven in fear of it burning. The bread that came out of the oven looked similar to some of the examples recovered in Egyptian breads: It had a rough texture and a shiny exterior. It was heavy, dense, and really fragrant. Once the bread cooled down, I broke it. The crumbs were dense as suspected, but not totally hard. The elasticity was similar a quick bread. The crust was thick with a good chew. The flavor was really nutty and gritty. It was much less grainy than I’d expected. And even if it was really different from what we expect from bread today, it tasted good. I imagine it was heavy enough to satisfy the appetite of the Egyptians. The bread wouldn't be very good for breakfast or sandwiches, but I imagine it is very good with soups and stews, as it can be used as a spoon. I finally ate this bread the next day with a thick lentil soup. Lentils were consumed often in Egypt, and I thought it made a good addition to the experience. The day-old bread wrapped in a towel was dryer and harder. I broke it to eat the lentils, and the liquid of the soup softened it and made it really good. It completed the lentils and it made a surprisingly delicious dish. 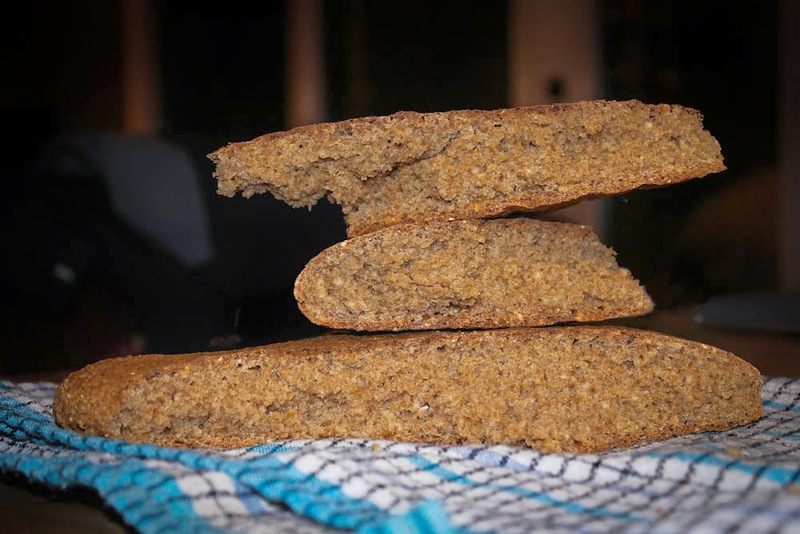 At the same time I was making this bread, I also decided to create my own version of bread inspired by all the reading and research, and influenced by Egyptian flavors, except I used current technology and products. The recipe was more complex than the previous one. The result was a nice golden bread, with a sweet flavor. The bread was fragrant, and both the emmer and the kamut gave it a good, nutty flavour. The dates were sweet and chewy, but not overbearing. It was delicious bread, with a lot of personality. Perhaps it was a pale imitation of its Egyptian ancestor, but I'm sure some pharaoh would have appreciated it. It is a powerful experience to follow the instructions of a lost recipe. We’ll never know for certain how ancient Egyptian bread actually tasted, but I can now better imagine the Egyptian kitchens, the work over the hearth, and the fragrant breads that were delivered to the tables. We know about the Pharaohs and the pyramids from films and books, but the everyday lives of the Egyptians are almost totally lost to us. Studying how they made their bread brings us closer to a better understanding. But it was not only an archaeological or anthropological experience; it also helped me to better understand the bread making process. It was a challenging and worthy experience to make my own flour, to transform the grain into a bread, to discover and control most of the process. After this, the fine white all purpose flour that I once used so much has less personality. Whole wheats, different varieties, and even different grains can turn into better breads. 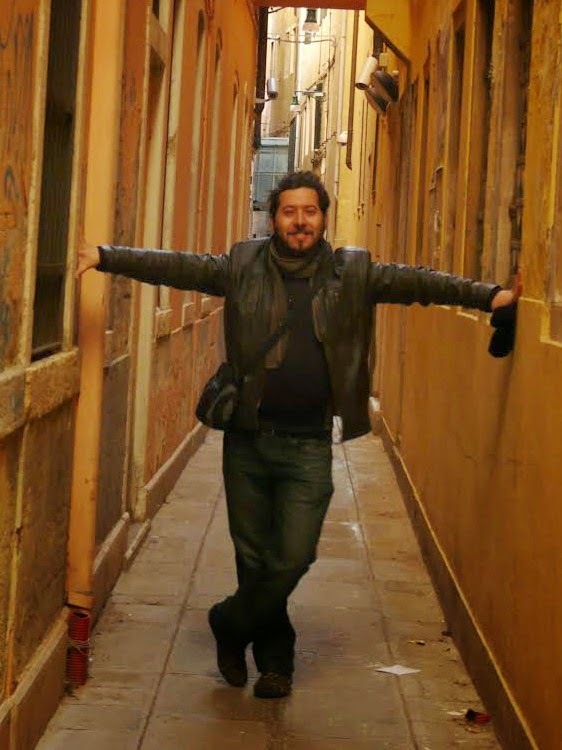 Miguel Esquirol is a writer and journalist from Bolivia. Currently he lives, writes and cooks in Montréal. in anthologies online and in newspapers. Great article Miguel! Your Egyptian-inspired bread looks awesome. Definitely pharaoh worthy! Also, unrelated, farro makes an excellent alternative for risotto-like dishes. Especially with wild mushrooms or squash. Italian specialty stores usually carry the grains, but they're much more expensive than arborio rice. Painstakinglý delightul,Miguel! No wonder the ancient Egyptians were so energetic and the men were half-time farmers and soldiers. What abt the Mayas' cooking? Everything from corn? Loved this! Thanks so much. 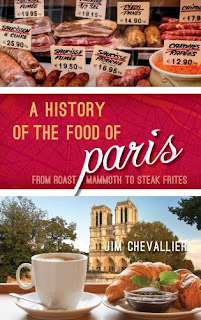 I often recreate ancient recipes for my historical fiction and this one is top notch both the history and the resulting food. Why didn't he just make a wild sourdough? We did with spelt (a hybrid of emmer and wild oat grass), and the results turned out nicely! (http://www.silkroadgourmet.com/a-loaf-of-leavened-mesopotamian-bread/). Yes, it was dense, but it did rise reasonably well and it tasted good if a bit tangy. The texture made us wonder if a mixed grain bread was more common. Also we have evidence from Mesopotamia that some of their breads had a lot of spices in them. (See recipe on my site). If the ancient Mesopotamians did it, chances are the Egyptians did it too. People talk! Hello Miguel, compelling read here! I am an amateur suddenly fixated on recreating the ancient Egyptian bread found here: http://www.reshafim.org.il/ad/egypt/botany/papyrus.htm. Can you give pointers please/help? I would really appreciate it. Thank you. I need towards regards for ones projects. I'm sure exhaustion an identical preferred give good results because of everybody someday to boot. i kind of wish it was more clear on what the ingredients were and what the instructions were. Maybe he could have added a quick recipe at the bottom. But did like the way he put his own experience into it. Did you ever think of sifting the bigger pieces of grain out of the flour before you made the dough? It was quite common to do this in the past, especially when the bread was being made for aristocracies. We realize in regards to the Pharaohs as well as the pyramids coming from motion pictures and also guides, nevertheless the each day lifestyles with the Egyptians are usually practically entirely misplaced to be able to us all. Researching where did they produced their particular loaf of bread delivers us all closer to an improved comprehending. Me gusto mucho el articulo! Gracias. Yummy bread and history all rolled into a delicious sandwich of amazing. Interesting read, what would happen if you boiled the whole emmer grains or millets in water for a long long time? Would it eventually turn into a lumpy hot cereal? In spite of the fact that in numerous parts of Egypt it is very conceivable to discover European nourishment, there is no experience that matches attempting the neighborhood sustenances. Customary Egyptian food is rich and fluctuated. I miss bread so much being on the Keto diet. Although, I made some keto bread last week and it wasn't bad! I love all cooking sites and especially this one. I wish they had more recipes but that is ok, I'll visit again! Amazing food makeover, Its looking Delicious , Thanks for sharing.